The way in which people today are shopping is changing drastically, and customers have come to expect a high level of customer service that usually includes a demand for delivery directly to their homes, complete with parcel tracking. Retailers everywhere are seizing this immediate opportunity to increase customer satisfaction by providing last mile delivery and mail tracking. Everything from online purchases, medical supplies, groceries, perishables and pharmaceutical drugs are being delivered directly to homes all over the world, and with some companies taking things one step further and offering the instant gratification of same day delivery and track my parcel, your company can no longer afford to deny your customers this service. Luckily, ShipTrack is the perfect addition to any home delivery service, enabling parcel tracking. Picture this: a customer is waiting for an important delivery at home, but the vendor in question does not offer a parcel tracking service. The customer calls the company, frustrated because they’ve taken the day off work after being given an expected delivery time, and the only way to determine the location of the shipment is by attempting to contact the driver, who may or may not be reachable. When the package is finally delivered, the customer is not home, creating a need for a second or third delivery attempt, ultimately costing both the customer and the courier time and money. ShipTrack eliminates this problem by enabling vendors to provide their customers mail tracking and complete visibility and control of their shipments, helping them to plan their day and know when to expect their orders to arrive. 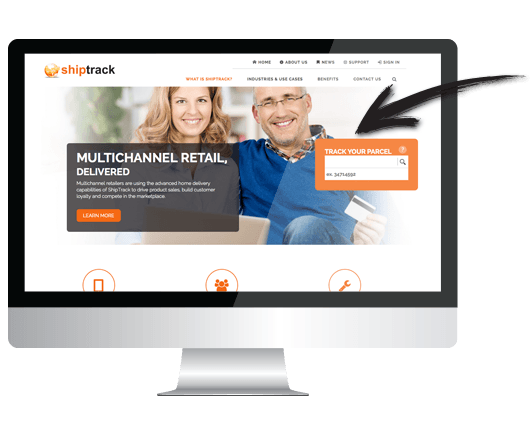 With ShipTrack, recipients receive immediate information about their packages in the form of delivery notifications. Drivers will also have the option to provide status updates and automatically report their location; they can even take pictures of shipments! The system electronically processes incoming orders, assigns routes based on delivery address, and allocates them to a specific driver based on the route. As a result, the delivery companies are able to make deliveries faster and more reliably, operations are streamlined and profits are improved. Retailers see increased revenues, improved customer satisfaction and are able to collect valuable business data. The easy-to-use, intuitive ShipTrack App, available for Apple, Android and Windows devices, enables you to quickly scan large quantities of packages, maintain your package inventory and ultimately eliminate paper, paper handling and costs.